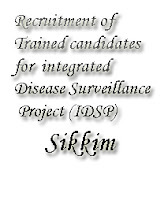 The State Health Society invites application from trained candidates for filling up the following psot under integrated Disease Surveillance Project (IDSP) on contract basis for the period of six months or till 31st March 2013.Age limit for both the categories : 45 years or below as on appointment date. The duration of written examination will be 3hrs. Short listed candidates who secure minimum 40% marks and above in the written exam will be called for viva-voce test. In case, the number of applicants is less than the number of post advertised, candidates would be selected through viva-voce evaluation. Application with the following documents should be enclosed and addressed to the Joint Director/ Programmes Officer, IDSP Cell, Deptt. of HC,HS&FW , by 17th Sept, 2012. Birth Certificate or class X passed certificate. Class X & XII mark sheet & certificate. SC/ST/OBC/MBC certificate as the case may be . NOC in case of in-service candidates.